Despite the small dimensions, the Q Acoustics speaker system promises great performance with a room-filling immersive sound for both music and movies. Earn 795 loyalty points when you order this item. Taking the satellites and sub from the award-winning q7000i package, the Q Acoustics Media 7000 comes with the new Q-AVA amplifier. Equipped with a built-in DAC, the Q-AVA stereo amp features two optical digital inputs, one analogue input and can stream audio wirelessly via Bluetooth. Housed in an elegant, all aluminium cabinet, the compact 7000i satellites are full range and genuine loudspeakers that deliver excellent sonic performances across a wide range of applications. The 7000i speakers boast two High Excursion 75mm ultra long throw mid/bass drive units along with a 25mm Ring Radiator tweeter and upgraded crossover. The result is even lower distortion, a faster transient response and spacious three dimensional sound that is more dynamic, yet still rich in detail and remarkably natural. The speakers incorporate an integrated adjustable stand which allows them to be wall or ceiling mounted. Alternatively they can be used as free standing speakers with the slim, dedicated optional floor stand. 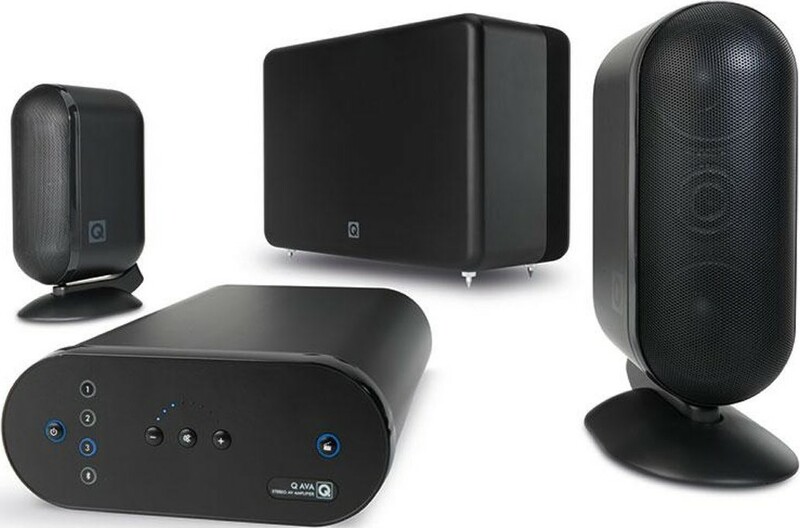 The 7070Si is a compact subwoofer that delivers a class leading sonic performance. The powerful 150W Class D amplifier drives an 8" high excursion low frequency driver capable of reproducing the speed and 'twang' of a double bass. The 7070Si's revolutionary 'Internal Firing' design makes it less dependant on room position to achieve optimum performance. For ultimate convenience, the 7070Si can even be wall mounted using an optional bracket. When combined with the matching 7000i speakers, their already impressive performance is transformed to comfortably outperform many large floorstanding models. The system aims to disperse sound evenly throughout the room through grilles on the top and bottom. The package delivers a sound that according to Q Acoustics “will astonish everyone who hears it... They’ll find it difficult to believe such huge dynamic sound comes from such small elegant speakers."